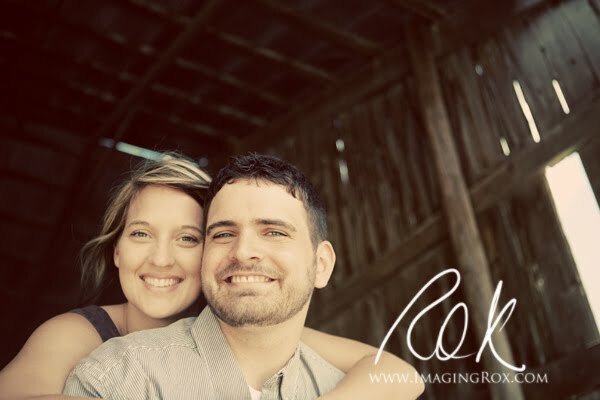 I wasn't sure how the e-session with Annie and Daric would go today...because of the weather. It rained overnight and we had planned to shoot at Annie's grandpa's farm. Storms filled the radar to the south of us this morning, so we delayed our session slightly so we could let things dry a bit more, which worked in our favor! The skies were cloudy with some sun peeking through intermittently, which is my favorite lighting for a session. I met Annie a couple of years ago now, so this was my chance to get to know Daric a bit better. He proved to be a fun guy who shows a lot of love for Annie. This image says it all (check out his leg). I know we'll have a great time at their wedding!